One great thing about Volkswagen is the enormous aftermarket for them. As I delve into VW ownership for the first time, I’ve quickly learned that their fans are enthusiasts on a seriously rabid level. Even Matt Farah, who’s driven practically every awesome car under the sun, really enjoyed the nearly stock Mk4 Jetta VR6 he drove in a One Take. The cars do have some issues, sometimes due to wear and tear over time, and other times due to penny pinching factory designs. But most likely someone, somewhere, has engineered a way around it, whatever “it” happens to be. 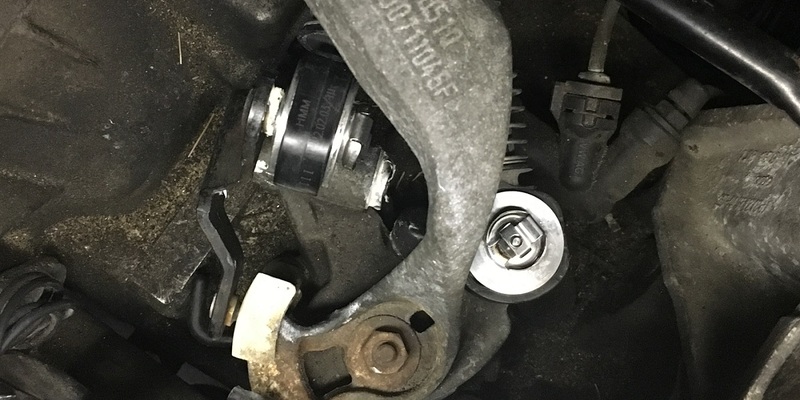 In the case of our 2003 Jetta, the transmission linkage bushings were shot, making shifting vague and difficult. I almost didn’t buy this car when it wouldn’t go into reverse, but a final valiant attempt by the seller got it into gear, proved to me that it will back up under its own power, and got him the sale. I’ve adjusted the shifter a couple of times according to the directions from DieselGeek.com. I’ve managed to enable all gears, including reverse, most of the time, but sometimes I found myself unable to get into fifth or reverse because there’s too much slop in the system. A friend once described the stock shifter of her Mk3 Jetta GLX as “a baseball bat in a barrel of coconuts.” That was when it was working as the factory intended, so you can only imagine how sloppy ours was after traveling most of the way to the moon. The rubber bushings at the transmission end of the shifter cables had worn out, and the extra play was causing our difficulty in finding all of the gears. Since this is the car in which I intend my wife to master the manual transmission, I want to make the experience as easy for her as possible. She already understands the clutch-in, shift, clutch-out process, but my Subaru BRZ was actually painful for her to shift, and she doesn’t want to risk hurting my recently acquired WRX. But she had no trouble with the lever in our friend’s Audi S4 Avant, or the Focus ST I reviewed last summer, so I’m optimistic that she’ll be OK in the Jetta. So is she – otherwise, she would’ve required an automatic, since she expects to drive this car, too. But that means making shifting as easy as possible, which it most certainly wasn’t. This needed to change. If you ask Volkswagen for a solution, they’ll tell you to replace the entire cable for $200 a pop, and there are two cables. Yeah, no. The aftermarket offers plenty of standalone replacement bushings made of various materials – rubber, Delrin, aluminum… After some research, I decided to go all the way and ordered a set of aluminum bushings from 42 Draft Designs. “Our shifter cable bushings are CNC machined from 6061 aluminum and fit precisely within the factory endlink,” their web site says. “Each bushing is sleeved with an oil-impregnated bronze bearing. This bearing provides constant lubrication and a lifetime of use without wear.” It sounds a lot more high tech than a chunk of rubber, that’s for sure. It’s also more expensive, but as 42 Draft Designs says, it should “eliminate sloppy shifts forever.” These bushings won’t wear out. Replacement was fairly simple. The cable end pops off the transmission after removing a clip with needlenose pliers. Do not lose this clip. Then you get to go medieval on the crappy old rubber, since it all has to come out to make room for the aluminum bushing. The one on the forward-back cable was actually in pretty good shape and took some work to remove, but the side-to-side bushing was old and practically fell out with a little work. That certainly explains why I was having trouble finding all of the gears. I slid the bottom half of the bushing onto the appropriate shifter pin (there are two sizes, so make sure you get them right), dropped the cable end on top, inserted the top half of the bushing, and reinstalled the clip. From there you’ll want to adjust the shifter as Dieselgeek describes, and you’re all set. That is, unless you don’t quite manage to get the clip back on the pin quite right and it disappears into the ether. I told you not to lose it! These sell for a dollar or so online, but it was annoying to lose it and have to wait for the new one to arrive. I bought two so I’d have a spare in case this happens again. The big question is how well do these work? For starters, I have no problem getting into all gears at all times, but a new rubber bushing would’ve done that. The shift lever itself hasn’t changed, so it’s just as easy to shift as before with the same fairly long, easy throws. But there is now a precise mechanical feel to shifting that didn’t exist before. It’s much easier to tell when you’re in gear and which gear you’re in. It’s amazing how much more sporty the car feels with a good precise shifter. Despite the long throw, the direct connection between the shift lever and the transmission makes the driver feel more involved in the driving process. Fahrvergnügen indeed! If your VW shifter is sloppy, I can’t recommend 42 Draft Designs’ bushings highly enough. Contrary to what VW says, you don’t have to replace the entire cable. ECS Tuning sells OEM style cable ends for $22.92 a piece, and you need two of them. But for $35, you can get these aluminum bushings for both cables, modify your existing cable ends to accept them, significantly improve your shifter feel, and make the car much more fun to drive. I actually enjoy the $600 Jetta’s shifter (with $35 worth of parts) more than the shifter in my newer, sportier WRX with over 200,000 fewer miles. I’m going to have to do something about that.